Call us hopeless romantics, but at ManageWP, we have long-term ambitions to establish ourselves as more than just another WordPress management service. Since being founded, ManageWP has effectively created a new niche in the WordPress community. Although multisite has been around for years, it does not offer a truly independent multiple site management environment. That was our aim with ManageWP, and so far, I think we are doing a great job. Our success has resulted in the emergence of competition. This is something we expected, and welcome heartily. Competition will keep us on our toes and drive us even further to offer the best possible service we can. However, I want to explain what sets us apart from every other multiple WordPress site management service out there. We believe that we have an incredible suite of features and functionality to offer, but we also have an incredible team, dedicated support, a rapid development cycle, and a longing dedication to our customer’s satisfaction that we are determined to maintain. So here’s a little bit of our story. 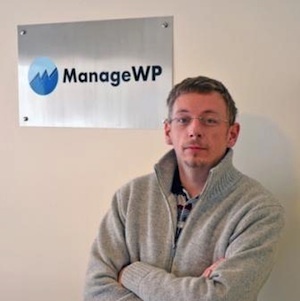 ManageWP was founded by Vladimir Prelovac in April 2010. At the time, Vladimir was already extremely well known for his extensive suite of WordPress plugins, which he had for the most part given away completely free of charge. 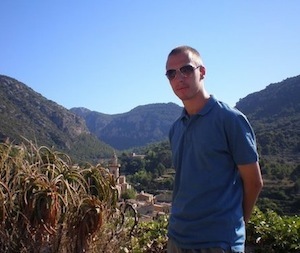 Vladimir is a published WordPress author, and was recently invited to attend the inaugural WordPress Community Summit. In a nutshell, he has contributed an enormous amount to the WordPress without asking for a great deal in return. He perfectly epitomizes the open source spirit that has helped turn WordPress into the enormous platform it is today. Every single one of us on the team at ManageWP look up to Vladimir, and it is an absolute pleasure to work alongside him. We love the WordPress community and will continue to support it with the likes of WordCamps and other WordPress related events. We will invest in WordPress companies, because they keep the community thriving. And we welcome competition with open arms, because it drives us to innovate. ManageWP is represented by an international team of nearly 20 people (and growing) — helping to build, support, and maintain the ManageWP service that focuses on providing the highest quality of security, service, and functionality to marketers, web developers, web designers, universities, governments, high-end enterprises, WordPress enthusiasts, hobbyists, and everyday people. We have nearly 40,000 customers, and we will soon be powering over 200,000 WordPress sites, with hopefully many more after that. Ivan — head of support. In our opinion, support is nearly as important as the product itself. We have all experienced shoddy support systems before, and it is something we are determined to avoid at all costs (literally). With that in mind, we have developed a bespoke support system so that we can provide the best possible service to our users. We don’t deal in different levels of support, escalation systems, or any of the other hoops that you typically have to jump through. Every single ManageWP user has a direct line to one of our WordPress support team experts, who can help them through whatever issue they are experiencing with speed and efficiency. We have taken the necessary steps to provide the highest level of support for one very important reason — we are determined to provide our customers with the highest possible level of care. Of course, we could have gone an entirely different route — a route that is fairly common in business today, and a route that, personally, disheartens me. We could let go most of our hard working and dedicated staff to save money and optimize profits. We could skimp on paying for high quality servers, services and tools. We could have decided to not give a damn about security, and just put any random code out in the wild. We could have opted to go with the default WordPress XML-RPC instead of producing our own OpenSSL encryption that goes above and beyond what WordPress offers. We could have not invested in sponsoring WordCamps, which helps local communities thrive and grow their WordPress awareness and influence. We could have halted investment in creating new and innovative features for our platform. We could have milked this project for every last nickel and dime, and then simply picked up and moved on to the next best thing. But it doesn’t stop there, as we could have done even more to squeeze every last penny out of our service. We could have not bothered with investing in extraordinarily talented American and European employees. We could have decided to not setup shop in the United States, to better serve our fellow American customers. We could have opted in outsourcing our work for rock-bottom prices, instead of establishing an office staffed with full-time employees in the heart of Belgrade in Europe. We could have produced the cheapest quality product possible, and we could have sold it for a massive premium when we first started — a tried and true cash grab operation. We could have done all of those things. And to be honest, if you’re a business that wants to go for gold without even running the race, these are the type of things that are done in the business world. We’re not saying this tactic is wrong — we’re just saying that this isn’t the business model for us. We decided that we wanted to be different — to be better — to be a proper business that takes care of our customers in the long term. And for our customers who have proper business needs and understand the value in these things, and for our customers who see value and are willing to pay to optimize their businesses, they happily support us. And for that, we are truly grateful. We decided that we wanted to do things the right way. We provide an exceptional level of support, and are expanding our support operations even further. We are investing in high-quality and secure technology. We hired a full-time security expert to ensure that ManageWP’s servers are safe. We have a full-time design team (which recently completed our new website design). We have a full-time development team. We have a full-time blogging team working on providing the latest and greatest WordPress news and views. We are building a sales team to help address the specific needs of individuals. We’re expanding our reach to multiple platforms. We’ve even been written about in .net magazine. And that’s only the beginning — we have so much more in store that I can’t wait for us to reveal to the world. Most importantly, we decided to invest an incredible chunk of our revenues into people to help us produce, design, develop, maintain, support, and expand the highest quality product in the marketplace. 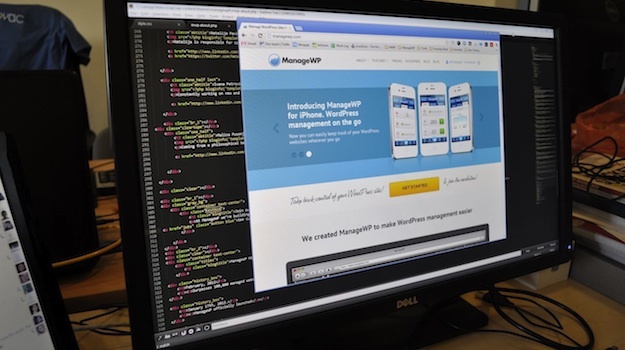 We are investing in the future of our company, so that when WordPress makes drastic changes in the future, ManageWP will adapt and work with those changes to continue providing you with the service that you are deserving of. Again, all these things that we are accomplishing have costs associated with them. We are running a serious business. And business, for us, is primarily about the people and experiences, not just the money. We are extremely proud to be in a position where we can provide people with jobs to help contribute to the WordPress community. And because we do this, we have the ability to invest in the WordPress community itself with an incredible platform to manage WordPress blogs of any number. Furthermore, if we have an opportunity to sponsor a WordPress event or pay for advertising on a WordPress-focused blog, publication, or newsletter, which directly helps those people behind the events and publications to continue to make a living, then we can’t help but feel great about that. We hope that others can appreciate that as well. But, again, few people write about or realize these things, which is very unfortunate. At ManageWP, we feel that the path we are taking is, in our hearts, the right one. It’s the path that results in happy customers, happy employees, and positive experiences. We want people to be able to accomplish what they set out to do in the business world, even if it isn’t necessarily with us. So for those of you that care about these things and truly value your business and hope to make it grow, we completely understand. We know that feeling, we love that spirit, and are willing to do whatever it takes to make sure that you have an incredible experience with ManageWP. We invite you to try us out. We invite you to get to know us better and contact us by any means to express your thoughts and opinions, good or bad. We welcome all feedback, because it’s our customers who are driving our development and our future. We have also been giving away some amazing goodies to those who suggest great ideas to us! Finally, if you haven’t already, I invite you to try out ManageWP. And I encourage you to get in contact with me personally, or any of Team ManageWP, if you would like to discuss our service or your needs. We will do whatever we can to accommodate you. It really is a pleasure to be a part of ManageWP team! You have lived up to your Manifesto, we are very satisfied with your service and pleased that you continue to improve upon it. Thank you for truly caring about the customer, we appreciate you!